The University of Notre Dame celebrated its 172nd Commencement Ceremony Sunday (May 21) inside the Notre Dame Stadium, with an audience of approximately 24,000 family, friends, faculty and graduates. The ceremony began an hour later than originally scheduled, to keep the celebration in the stadium and avoid rain, which fell even as guests arrived to watch their graduates take to the field. As all 2,081 degrees were conferred and President Rev. John I. Jenkins, C.S.C., issued his charge, thick, stubborn clouds that had been present for most of the morning finally parted, allowing the sun to shine down on the Class of 2017. Salutatorian and Hesburgh-Yusko Scholar Jose Alberto Suarez offered the commencement invocation to the graduating class, and valedictorian Caleb “C.J.” Pine encouraged the Class of 2017 to give of themselves and be of service to others and of service to justice during the valedictory address. Pine, a Truman Scholar and Gilman Scholar, member of the Glynn Family Honors Program and a Hesburgh-Yusko Scholar, spoke about how his experience as a student at Notre Dame shaped his vision for life, as well as the deeper magic and transformative power that comes with being a Notre Dame graduate. Pine also encouraged the Class of 2017’s Fighting Irish to fight for others. In his introduction of Vice President Mike Pence, Father Jenkins also recognized the reality of “a fractured nation, with deep divisions and raw political feelings,” in the midst of difficult times. Jenkins urged those listening to strive for something higher, embracing ideas and listening to differing views. 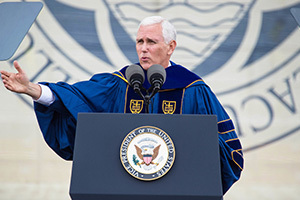 Pence was the first U.S. vice president to deliver the commencement address at Notre Dame. 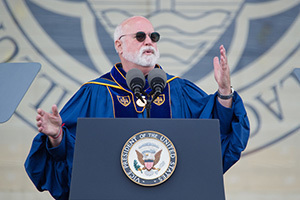 The vice president urged graduates to carry the values and ideals students had learned during their time at Notre Dame into their future lives and careers; to be leaders in their communities, families and professional fields; and to hold on to the Catholic faith and values instilled in them. Approximately 100 graduates left the ceremony in protest during the vice president’s speech. 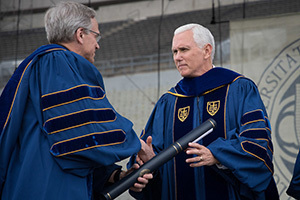 Pence received an honorary degree along with former NASA administrator and astronaut Maj. Gen. Charles F. Bolden Jr.; Cardinal Kevin Farrell; Alice Gast, president of Imperial College – London; Rev. Martin Junge, general secretary of the Lutheran World Federation (LWF); Philip J. Purcell, Notre Dame graduate, member of the University’s Board of Trustees and founder and president of Continental Investors; and Martha Lampkin Welborne, Notre Dame graduate and senior vice president for corporate real estate and global facilities with The Walt Disney Co.
Rev. Gregory J. Boyle, S. J., founder and executive director of Homeboy Industries, received the prestigious honor of the Laetare Medal. Boyle’s impassioned speech elicited laughter and tears from the crowd. The ceremony concluded with a charge by Jenkins, who echoed the sentiments of previous speakers and implored the Class of 2017 to continue the Notre Dame tradition. Originally published by Jessica Sieff at news.nd.edu on May 21, 2017.